Leave it to the clever scientists at BYD Auto, who came up with the ferrous battery hybrid and the in-show test drive, to invent a new solution to keyless entry. Tired of carrying a clunky key fob everywhere you go? Try a sharp-looking watch that includes locking functions as well as wireless startup so you can start your car from your watch, just like Inspector Gadget! 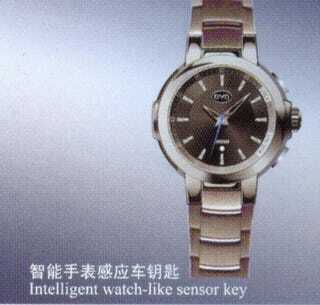 The watch is also kinetic, so you never run out of batteries. And that's not all BYD has up/on its sleeve. The Funniest Sign at the Shanghai Show, Plus, BYD F8!